Metamorpho (real name Rex Mason, also called The Element Man) is a fictional superhero appearing in American comic books published by DC Comics. He was created by writer Bob Haney and artist Ramona Fradon. He is a founding member of the Outsiders, and has also joined multiple incarnations of the Justice League. The character has been moderately popular since his introduction in 1965. Originally adventurer Rex Mason, he is converted into a man made of a shifting mass of chemicals after being cursed by an ancient artifact that he has retrieved. Metamorpho's creator, Bob Haney, had seen success with DC Comics in 1963 with the titles Metal Men and Doom Patrol, featuring bands of superheroes exhibiting fantastic powers. Under the editorial management of George Kashdan, Haney was asked to capitalize on these titles' popularity with a similar character. Metamorpho, the Element Man, debuted in The Brave and the Bold #57 (January 1965). As first conceived, Metamorpho was a parody of the fantastic characters that populated comic books in the 1960s. Artist Ramona Fradon was coaxed out of maternity retirement to illustrate Metamorpho's first appearances. The popularity of Metamorpho's appearances in The Brave and the Bold led to a 17-issue ongoing series between 1965 and 1968. Metamorpho also appeared during this time in two issues of Justice League of America (#42 & #44) and became the second superhero to decline an invitation to join that organization (Adam Strange being the first), though he did become a reservist, eventually being called in during a Justice League/Justice Society crossover to help find and rescue the Seven Soldiers of Victory. Metamorpho appears on the cover of Aquaman #30 as one of the pallbearers (along with Batman, Hawkman, and Superman) at the "Sea King's Funeral". Metamorpho also appears in a series of backup stories in Action Comics #413–418 and World's Finest Comics #218–220 and #229. In 1975, Metamorpho appeared in 1st Issue Special #3, a brief anthology series consisting of one-shots. That issue was written by Bob Haney and illustrated by Ramona Fradon, Metamorpho's creators. Haney and Fradon had met at the 1974 San Diego Comic-Con, and while reminiscing, it emerged that both of them regarded Metamorpho as one of the features they'd most enjoyed working on, leading them to ask DC if they could do one more Metamorpho story together. Fradon later commented, "I think we both felt that Metamorpho was our baby. I never had an experience like I had working with Bob Haney on Metamorpho. It was like our minds were in perfect synch ... it was one of those wonderful collaborations that doesn't happen very often." After becoming a charter member of the Outsiders in 1983, and member of the European branch of the Justice League International, Metamorpho received his own four-issue mini-series in 1993. In 2005, DC Comics reprinted Metamorpho's early The Brave and the Bold appearances and the entirety of the 1965 series as one of the company's volumes of Showcase Presents. In 2007, Dan Jurgens launched the six-issue series Metamorpho: Year One. As part of a Wednesday Comics, Neil Gaiman wrote a 12-page Metamorpho story that Mike Allred illustrated. In 2016 he starred in a new comic book series titled DC's Legends of Tomorrow. Rex Mason is an adventurer who is hired by Stagg Enterprises CEO, Simon Stagg, to retrieve a rare Egyptian artifact, the Orb of Ra. Shortly after hiring him, Simon Stagg learns that Mason has been dating his daughter, Sapphire Stagg. This and other incidents begin to fuel in Stagg a dislike for Mason that ultimately leads to a plot to kill him. In an Egyptian pyramid, Rex Mason is knocked out by Simon's brutish bodyguard Java and is eventually exposed to a radioactive meteorite from which the Orb of Ra was fashioned. A tremendous flare-up of its radiation transforms Mason into Metamorpho, the Element Man. He gains the ability to shapeshift and change himself into any element or combination of elements found in the human body. It is also established in his origin story (see: The Brave & The Bold #57) that Metamorpho is virtually invulnerable in his inert (untransformed) state, when Stagg, afraid that Rex is going to kill him, shoots him point-blank without effect. The Orb of Ra, however, has the same effect on Rex that kryptonite has on Superman. Thus Stagg continues to control Metamorpho using the Orb. Later, it is revealed that Mason is but one of many metamorphae, created by the sun god Ra – using the meteorite – to serve as warriors in his battle against the god Apep, "the serpent who never dies." Metamorpho, unlike most super-humanoids described in DC Comics, cannot assume a normal, fully human appearance, being no longer composed of flesh, blood and bone. As such, he regards his metamorphic powers as a disease and seeks a cure for his condition. Because he considers himself a freak and wishes only to be restored to his former human state, he rejects an offer of membership from the Justice League of America in JLA #42. Green Lantern attempts to change him back using his power ring, but due to a "yellow" component of the meteorite radiation, is unable to make him normal again. Metamorpho briefly has a crimefighting partner named Urania "Rainie" Blackwell, a woman who deliberately exposed herself to the Orb to gain its powers. She calls herself Element Girl (nicknamed "the Chemical Doll") and works with him on a number of cases. Issues #16–17 were intended to show a new direction for the series, with Sapphire marrying a man named Wally Bannister and Metamorpho going off with a mysterious Mr. Shadow to deal with an immortal queen. Bent on world conquest, the queen (an exact lookalike of Sapphire's) marries Metamorpho. She later steps outside her mystic city and instantly ages 2,000 years. When Wally Bannister is murdered by Algon (a metamorph who has lived for centuries in a depowered state), Metamorpho is framed. Instead of coming to his defense against the false accusations, Metamorpho's colleague Mr. Shadow comes forth as an enemy. It is discovered that Mr. Shadow was attempting to enslave Metamorpho all along. Metamorpho is tried and convicted by a jury of rabble and is then executed by absolute zero. Element Girl later revives Metamorpho, and Algon, the real murderer, is killed by molten lava minerals in an attempt to regain his burned-out powers. It is later learned that Mr. Bannister's murder was actually engineered by the villainous Prosecutor, who is then killed by an insectoid villain in a cocoon. At this point, issue #17 ends, and the story is never continued. Metamorpho reappears years later in The Brave and the Bold #101 (April–May 1972). It is revealed that Metamorpho had spent the period after the end of his own series immersed in a painful chemical bath concocted by Stagg in an attempt to cure his condition. Stagg retrieves him from this "cure" too early because he needs Mason to save his endangered daughter Sapphire. Metamorpho goes on to star in a new backup series beginning in Action #413 (June 1972). There is no reference in this revival series to the events or characters of his previous two issues. Urania Blackwell, unreferenced since the end of the regular series, is later revealed to have ended her partnership with Metamopho when her unrequited attraction to him became too much for her. Blackwell's powers are removed at her own request by the sun god Ra, resulting in her death; the episode, in Neil Gaiman's Sandman, involves Death. Death mentions Algon's death in passing, trying to convince Blackwell that she won't live forever. Metamorpho spends some time working with the Outsiders. While in the despotically ruled country of Mozombia, Metamorpho is subdued and taken apart. The tyrant's forces keep him inert with a constant application of radiation. He is freed by Katana's indestructible sword, which had been latched onto a live electrical wire. While leaving Mozombia, the Outsiders' plane is shot down by the Bad Samaritan. Metamorpho and the others spend some time stranded on a deserted island, simply too far away from land to rescue themselves. Metamorpho perishes, for the first of multiple times, during the Millennium event. The scientific adviser to the Outsiders, Dr. Jace, had decided that life with the more logical Manhunters was preferable and she betrayed the team. They fought back, but Metamorpho had been brainwashed into assisting Jace. He was killed in the resulting battle. He returns during the Invasion miniseries, when a gene-bomb set off by invading aliens affected his biomass. Metamorpho spent some time with the Justice League, including Justice League Europe. There, he encounters Sapphire Stagg again. He becomes involved in a battle with the Metal Men, who had been tricked by Simon. His League friends, Rocket Red and Animal Man, were at the site of the battle, but were being detained by Java. At the conclusion of the battle, Metamorpho learns he had a son with Sapphire. Unfortunately, the baby boy's touch harmed all but Sapphire and Metamorpho. When Java held the baby, Java's arms melted. Metamorpho handed the baby over to Simon, who became convinced he would die, harmed like Java had been moments ago. However, something in his genetic structure protected him, just as it did with the baby's mother. Simon's stance softened and everyone was set free. Doc Magnus, the leader of the Metal Men, offered his services in creating new arms for Java. On the way home, Metamorpho's friends were puzzled as to how he knew Simon would be unaffected by the child. Metamorpho indicates that he had hoped the baby would kill Simon. Metamorpho would later have a romantic relationship with Crimson Fox, which was cut short by her apparent murder. His personal investigation of the incident uncovers multiple layers of lies and deceit. During his time with the team, while fighting the planet-smashing aliens called The Family, Metamorpho is hit by a powerful energy blast that destroys his body. He quickly re-forms in a totally different look. He will sport this new look until his next demise. Later, the Hyperclan attacked the Justice League of America's orbiting base, destroying it. Metamorpho protected three of his teammates, Nuklon, Obsidian, and the original Icemaiden, in a giant, fluid filled ball. The intent was for them to survive reentry into Earth's atmosphere. The three make it, injured but alive, but Metamorpho does not. He was buried with solemn honors. After a temporary resurrection by the wish-granting Id (fundamentally flawed because the wisher, his son Joey, only wished for him to be back rather than to be alive), he would return some time later. Sapphire Stagg used the Orb of Ra to bring Metamorpho back to life, and he briefly joined the Doom Patrol. Shortly thereafter, an accident with one of Simon Stagg's experiments turned Simon, Sapphire, and Joey into an energy being, and caused Metamorpho to take on the form and personality of Java. "Java" kidnapped Black Canary, asking for her help in rescuing the others. With Canary's help, he became Metamorpho again and managed to return the others to their normal forms. At the same time, Metamorpho had seemingly been appearing in the Outsiders (vol. 3) series, but Rex Mason informed the team that their "Metamorpho" is a regrown fragment of his own body. Rex attempts to reassimilate his "twin", but the Outsiders convinced him that the "twin" deserves the chance to lead his own life. This second Metamorpho chose the name "Shift" and developed a relationship with Indigo, becoming depressed over her death. After the events of One Year Later, Shift willingly chose to be reassimilated into Metamorpho, because he had killed several people. Rex has stepped in to fill Shift's position in the Outsiders, while a full account of Shift's crimes is explained in the Outsiders (vol. 3) Annual; he had inadvertently killed 44 people during Black Lightning's escape from Iron Heights Penitentiary. Metamorpho continued to serve on the Outsiders when Batman took over, and following its further restructuring following Batman's apparent death. He was apparently killed alongside the rest of the team in a satellite explosion orchestrated by Talia al Ghul. On September 2011, The New 52 rebooted DC's continuity. In this new timeline, an August 2013 story reveals that the Outsiders are revealed to have survived. It is mentioned that Metamorpho was able to save the team by using the same technique he used to rescue the Justice League during the Hyperclan's attack many years ago. He is also shown as one of the candidates for the new Justice League International, but he is ultimately not chosen. In the "Watchmen" sequel "Doomsday Clock", Metamorpho is featured on the news as an example of the "Superman Theory" where the government has been experimenting on humans to give them superpowers. 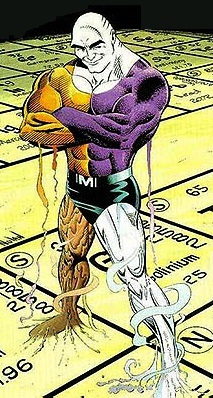 Metamorpho was transmuted into Nth Metal by Simon Stagg as part of his plot to open the portal to the Dark Multiverse. While trying to get Simon Stagg to close the portal with the help of Plastic Man, Mister Terrific is sucked in to the portal with Plastic Man and Metamorpho as Plastic Man shields them from the Dark Multiverse energy which he is immune to. Upon arriving on a lifeless world, they encounter Phantom Girl who has been trapped in her intangible form and had no knowledge of sending a signal. When the four of them find a computer in the gut of a dead giant creature, they are greeted by a hologram of Tom Strong who states that they are needed to save the universe. Mister Terrific, Plastic Man, and Metamorpho learn from Phantom Girl that she was stuck in intangible form since she was a child. After the four of them made it back to their world, Mister Terrific tries to leave the three of them at Simon Stagg's compound only to be drawn back to them. Due to the effects of the Dark Multiverse energy, Mister Terrific concludes that they can't go their separate ways due to this bond. Metamorpho can transmute his body to any of a wide variety of elemental compounds and form it to his will. Originally, he was limited to the elements which occur naturally in the human body. Over time, this limitation seems to have disappeared. He can alter the shapes and consistencies of these elements and combine them to form complex compounds. Rex can assume forms of gas, liquid or solid states. Metamorpho can also shape parts and portions of his body instead of the whole. He can form such complex shapes as a tank and a bicycle and such simple forms as a cloud or a spring. The nature of Rex's body provides him with natural body armor, offering damage resistance from blunt attacks and energy attacks. Rex Mason/Metamorpho appears in the 12-issue mini-series Justice, as a member of the Justice League. In the Elseworlds story JLA: The Nail, an unstable Metamorpho is forced to kill the Thinker by the unknown mastermind behind the recent anti-metahuman propaganda. He later attacks Lexcorp tower in Metropolis, but J'onn J'onzz intercepts the attack, Metamorpho weakly explaining that someone forced him to kill by threatening his family, before he died as a result of their enemy's attempt to brainwash him. In Darwyn Cooke's 12-issue series, DC: The New Frontier, Metamorpho appears with the rest of the Justice League at the end of the series. In Batman: Arkham Knight prequel comic, Metamorpho was the result of a project named Project: Meta, an attempt to turn mud obtained from Clayface into weaponry by Stagg Enterprises. The project's head scientist, upon seeing Batman and Deadshot snooping around his lab, opened fire on the pair with a laser rifle, hitting the tank storing Metamorpho and freeing it. After a brief fight, which resulted in Metamorpho escaping into Stagg Enterprises' parking lot, Batman was engulfed. Using his line launcher, Batman escaped and threw three sonic Batarangs into its body, which exploded inside it. Batman then took some samples for later study. Metamorpho appears in Injustice: Gods Among Us's prequel comic. He is depicted as a member of High Councillor Superman's Regime. In Year Four when Plastic Man breaks into the Regime's underwater prison to rescue his son, he is confronted by Metamorpho who is the prison warden. Before Metamorpho could act, Plastic Man teleports him, his son and all of the prison's inmates to a mirror dimension using some of Mirror Master's technology. In Year Five after Deathstroke breaks into S.T.A.R. Labs to get the Mother Box for Batman and Lex Luthor, he is greeted by Metamorpho before he can leave. This results in Metamorpho's death after a tense fight against Deathstroke. Metamorpho in Justice League Unlimited. Metamorpho appeared in the Justice League animated series, voiced by Tom Sizemore. Here, his origin has been altered: rather than his powers coming from the Orb of Ra, Rex Mason is exposed to a mutagen that transforms him into Metamorpho. He is also an old Marine friend of John Stewart. Metamorpho makes several non-speaking appearances in Justice League Unlimited. Metamorpho appears in Batman: The Brave and the Bold, voiced by Scott Menville. This version is a teenager who was a member of the Outsiders. Metamorpho appears in Beware the Batman, voiced by Adam Baldwin. In Arrow, Metamorpho is name of a company located in Star City. According to John Diggle, it was condemned after the Glades earthquake, the man-made disaster that "leveled" the Glades. Metamorpho is a background character in DC Super Hero Girls. Metamorpho appears in Young Justice: Outsiders, voiced by Fred Tatasciore as a member of Batman Inc. Here, as a side-effect of his powers, he has constant pain racking his body every time he uses them; though he learned to live with it. He joined Batman and Katana on a mission to Santa Prisca to locate Terra for the Team, and though they got the information they needed, they were almost stopped by Bane, Deathstroke and Lady Shiva. Despite the villains' best efforts, the heroes were able to escape with Oracle's help. Metamorpho is one of several heroes at the end of Justice League: The New Frontier. Metamorpho appeared in Teen Titans Go! To the Movies. Metamorpho appears in Justice League Unlimited's spin-off comic book, issue #31. Metamorpho appears in the 1975 spin-off of the Justice League of America Peter Pan Records (Power Records) LP, in a solo audio action adventure called "Metamorpho — The Element Man — Fumo, The Fire Giant". ^ Jones, Gerard; Will Jacobs (October 23, 1996). The Comic Book Heroes. Rocklin, CA: Prima Lifestyles. pp. 76–77. ISBN 978-0-7615-0393-4. ^ "Aquaman #30 - The Death of Aquaman". Comic Vine. Retrieved 15 April 2016. ^ Stroud, Bryan (May 2013). "Metamorpho in Action Comics". Back Issue!. TwoMorrows Publishing (64): 22–27. ^ a b Abramowitz, Jack (April 2014). "1st Issue Special: It Was No Showcase (But It Was Never Meant To Be)". Back Issue!. Raleigh, North Carolina: TwoMorrows Publishing (71): 42. ^ Minnick, Remy (January 30, 2009). "Gaiman & Allred on Metamorpho". Comic Book Resources. Retrieved January 31, 2009. ^ "Aaron Lopresti Talks Metamorpho in New DC's LEGENDS OF TOMORROW Series". Comic Vine. Retrieved 2018-09-23. ^ Beatty, Scott; Jimenez, Phil (October 4, 2004). The DC Comics Encyclopedia. Dorling Kindersley Limited. p. 202. ISBN 978-0-7566-0592-6. ^ Doomsday Clock #3 (January 2018). DC Comics. ^ The Terrifics #1. DC Comics. ^ The Terrifics #2. DC Comics. ^ The Terrifics #3. DC Comics. Metamorpho the Element Man at Don Markstein's Toonopedia. Archived from the original on February 17, 2016.